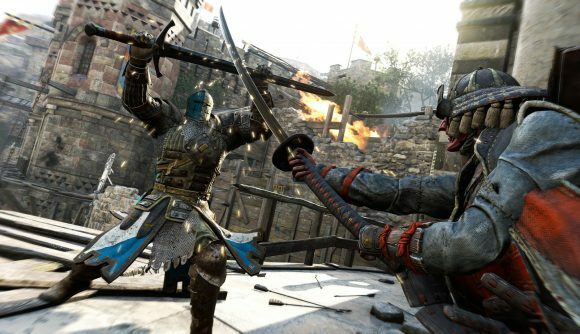 August 23, 2018 For Honor is temporarily free and setting some major records. For Honor’s Starter Edition is temporarily free, and the promotion has brought with it an unprecedented amount of interest in the game, to the tune of a concurrent player peak well over 200,000. Obviously, a free promotion brings more people in, but that’s the eighth highest player count in Steam history – a pretty stunning record even if it is free. The player count peaked at 216,399 overnight, and that’s a pretty major uptick from last month’s peak of 8,204 – or even the all-time record of 45,923 set back at launch. Yes, For Honor offers Steam trading cards, and a significant number of those players are likely idling to get a handful of pennies on the Steam store, but the numbers are still impressive. In fact, it’s even beat out the all-time peak for the Rainbow Six Siege player counts – and that’s a go-to example for a Ubisoft game able to escape from a mediocre launch to find great success later on. Whether For Honor’s impressive week leads to further success down the line remains to be seen, but it’s a promising start. During a financial report back in February, Ubisoft said For Honor has 7.5 million registered players, and 1 million monthly active users, though those numbers are spread across consoles, as well. Either way, the topic’s been a bit of a touchy subject with the company. This much interest can only be good thing for For Honor’s prospects – the last few month have shown a general increase in player numbers, as you can see on Steam Charts. People are finding new reasons to stick around, and even if those hooks only grab a small percentage of the people currently playing, that’s still a whole lot of interest to bring in. Head to Steam if you want to pick up the game for yourself.